Consider installing browser extensions or plugins to help minimize your online footprint. 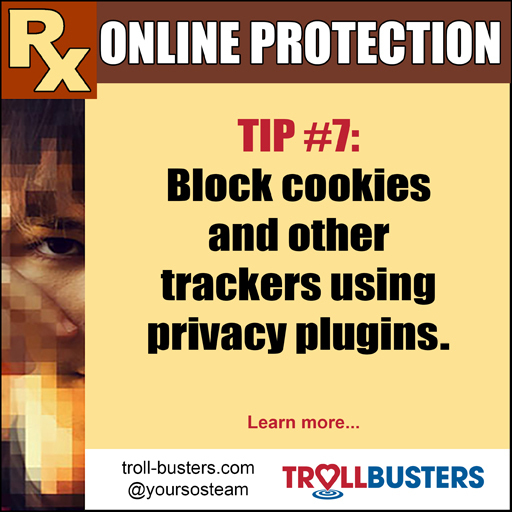 These tools primarily protect you from advertising, or from companies tracking you across multiple sites through cookies and other methods that track your browsing habits. However, this type of blocking also helps minimize the personal information websites can find out about you, which helps prevent them from being compiled or winding up online. Ad blockers, such as Adblock Plus or Ghostery, will block out many ads and also protect you from ad-based malware being served through sites you trust. AdBlock relies on an external filtering list created by its users. Ghostery lets you see some of the trackers placed on web pages and lets you learn more about the companies working behind the scenes, so you can block scripts, images, etc. from companies you don’t trust. Sometimes these extensions make it difficult to use sites that you’re on, in which case you can selectively turn the block off for those URLs. Privacy Badger doesn’t block all ads, but it will protect you from third parties trying to track you through spying ads or invisible trackers. It works with most antivirus software and trackers, however it is not compatible with the Avast antivirus extension. The cool thing about Privacy Badger is that if it renders a site unusable, you can look at a list of potential culprits and adjust the slider setting to improve functionality.